The Psychology of Globalization: Identity, Ideology, and Action underpins the necessity to focus on the psychological dimensions of globalization. 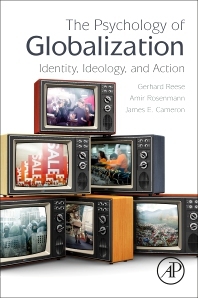 Overviewing the theory and empirical research as it relates to globalization and psychology, the book focuses on two key domains: social identity and collective action, and political ideology and attitudes. These provide frameworks for addressing four specific topics: (a) environmental challenges, (b) consumer culture, (c) international security, and (d) transnational migration and intra-national cultural diversification. Arguing that individual social representation and behavior are altered by globalizing processes while they simultaneously contribute to these processes, the authors explore economic, political and cultural dimensions. Gerhard Reese is Professor of Environmental Psychology at the University of Koblenz-Landau, investigating processes of social identity, collective action, social inequality, and environmental behavior in the frame of globalization. Amir Rosenmann is a research fellow at the Cultural Psychology Lab, the University of Haifa, Israel, now residing in Detroit, Michigan. His research focuses on issues of gender, social power and social identity, as those intersect with the processes of globalization and consumerism. He serves as an Associate Editor at the Journal of Cross-Cultural Psychology. Jim Cameron is Professor of Psychology at Saint Mary’s University in Halifax, Nova Scotia, Canada. He is interested in social identity processes with respect to collective action, multiculturalism, well-being, and globalization. "You have heard the old song that what the world needs now is love, apparently. What the study of globalization desperately needs now, however, is the masterpiece before us. I guarantee that, as with any book that has such a breath taking scope, you will encounter ideas and conclusions that will provoke you and some you may disagree with. I certainly did. I also guarantee that nowhere else will you find such a lucid and compact yet comprehensive treatment of the role of psychology in understanding the form of the world around us today: the world as we experience through our screens and on our streets and spend so much time arguing about. That success clearly rests on the intelligence of the observations of this brilliant writing team, people who have made important theoretical and conceptual contributions to the material they cover. -- Craig McGarty, Social Sciences and Psychology, Western Sydney University"